The summit of the five Caspian states will be held on August 12 in Aktau, Foreign Minister of Kazakhstan Kairat Abdrakhmanov told journalists on July 17. “Currently, foreign ministries of all the five Caspian states, namely Kazakhstan, Azerbaijan, Iran, Russia and Turkmenistan, are actively working on preparations for the 5th Caspian Summit,” he said. The FM added that all states have already confirmed their participation through diplomatic channels. It is expected that the convention on the legal status of the Caspian Sea will be signed within the upcoming summit. The difficulties in determining the status of the Caspian Sea are linked, in particular, with the recognition of it as a lake or sea, the delineation of which is regulated by different provisions of international law. 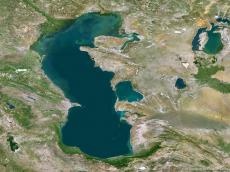 The status of the sea remains a key topic of discussions at the Caspian states’ summits. The leaders of the five countries met for the first time in 2002 in Ashgabat. The second Caspian summit was held in Tehran in 2007, the third one in Baku in 2010, and the fourth summit – in Astrakhan in 2014.